Guam military rentals are available in every part of the island. If you are a military member stationed in Guam, consider renting outside of base! There are many rentals to choose from including, spacious homes near base and beach front condos in downtown. On Guam majority of the rentals will be within the military OHA, so you will have quite a few options to choose from. On top of the list of popular Guam military rentals are places near or on the beach. Yes, there are places actually on the beach or with an ocean view that are within the military OHA, unlike other places in the world. Imagine, waking up to the sound of the waves on the shoreline and watching the sun set with a cold beverage in hand to unwind from a long days of work. It is completely possible for many military members living on Guam. As an added bonus, many of the beachfront condos & apartments are located in the downtown area of Tumon and Tamuning, so if you are ever tired of the ocean view, you are just a stone throw away from the restaurants, shops and nightlife in Tumon. Now if you are looking for Guam military rentals near Andersen Air Force Base, where your commute to work to base is 5 to 15 minutes away, you have a variety of homes to choose from. Many of the homes offer a secure family friendly atmosphere, with some places offering gated entry and security guards. Some of the popular rentals available in the area around Andersen Air Force Base are Paradise Estate, Perez Acres, and Chalan La Chanch. For Guam military rentals in the southern area near Naval Base Marianas, there are areas with beautiful new homes. Some of the popular villages close to Naval Base Marianas are Santa Rita, Yona, Piti, and Talofofo with Talofofo being one of the more popular. Talofofo is one of the farther villages from Naval Base, but the natural beauty and the tropical ambiance is something that lures many residents to the area. In the southern parts of the island, there are no gated communities, but the neighborhoods in the area are quiet and very much pleasant. If you are not sure what area would fit your needs, start by taking a look at the popular rentals. 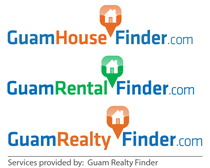 It gives you pictures, videos, and useful information about popular rental neighborhoods in Guam. But when you need to look for a rental, give us a call. With Google map not working too well and many missing street signs, it might be best for us to take you around. At least if you get lost, you will be with a knowledgeable local.